The default UI sequence that you’re given when creating a new project with Installshield has a few unessasary and redundant screens, in my opinion. Now, I understand why it’s displaying this dialog. When you click yes on the cancel dialog it fires and EndDialog Exit event and the return code is 2 if the user cancels. The SetupInterupted dialog’s sequence is -2 and so this dialog is displayed. From a user’s experience it’s needless. If I cancel, I don’t need the option to see an msi log either. On the behavior view for the CancelSetup dialog’s YES button I added a DoAction event that calls the custom action: CancelButtonPressed with a condition of 1 (always run). UPDATE: Stefan Krueger @installsite was kind enough to point out that you can set properties from the UI dialog without the step of creating a custom action. Funny, because I realized this later that night and didn’t have the energy to update the post at the time. And he’s right,.. take a look at the ReadyToInstall dialog’s InstallNow button to see that [ProgressType#] properties are set in this manner. Thanks Stefan! Now when I click cancel and confirm with the YES button, the installer actually exits.. imagine that! What specifically do you mean by “On the behavior view” in step 1? 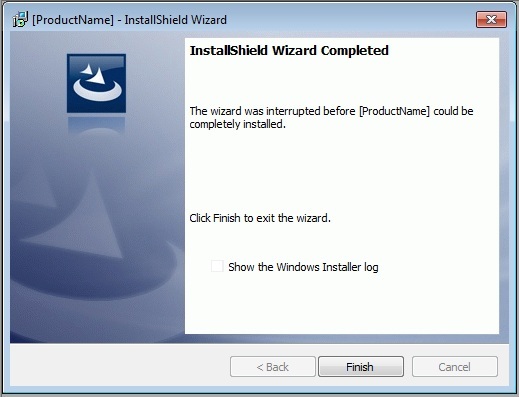 Please keep in mind – I’m building an InstallScript MSI Project in InstallShield 2011 Pro so maybe I have a different project view than you do. Actually I don’t see a ReadyToInstall dialog either…I’m confused. Any hints to help with my confusion would be greatly appreciated! Yes, you seem to be using a Basic MSI Project. It all makes sense now! thanks for the positive feedback. Great to hear.